Once you realize that there is no solution to the government’s debt death spiral, it’s only natural to wonder why so few people seem to realize or care that this is the case. If you’re doing well right now, what else really matters? The stock market seems to be on a bizarro perpetual escalator to neverending prosperity, despite rafts of economic fundamentals that paint a portrait of debt-bloated, weak economy, oceans of free debt have been available for years on end to fund lifestyles well beyond earned means, and so long as one has sufficient exposure to risk assets, why bother worrying about big-picture insolvencies that are still years away? If one feels wealthy today, tomorrow’s grim macroeconomic realities might as well be taking place 1,000 years from now, on Mars. What if you’re among the vast majority of Americans with little to no savings or assets? Television exists. Candy Crush exists. Alcohol exists. All manner of escapism, readily available and cheap, invite you to not to think about it. Still, it’s happening. Inarguably. 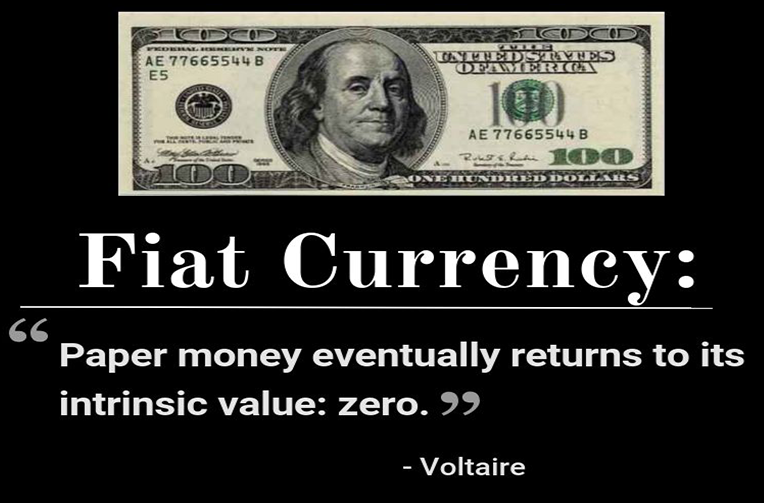 The dollar is being diluted into oblivion and there is hardly even lip service being paid to the simple fact that it will follow every other fiat currency ever introduced over the course of history into full-on collapse. Knowing this will happen, and understanding nearly no one is acting in ways to capitalize on this future state, allows you to buy stores of contrarian long-term value today at prices that are wildly cheaper than they should be. Don’t despair the opportunity, don’t wish physical gold and silver were more expensive already. Future price appreciation should be remarkable indeed, and the only skill you need master to profit from it is the ability to wait. This week the Social Security and Medicare Boards of Trustees released their 2018 Annual Report. Inside they revealed that the Medicare trust fund will be depleted in 2026 and the Social Security trust funds – both for old-age benefits and disability insurance – would likely be depleted in 2034. So what happens when these milestones are reached? Will entitlement dependents find themselves up the creek without a paddle? Not exactly. Most likely, the Treasury, in concert with the Federal Reserve, will go full imbecile. They’ll create money from nothing to make good on their obligations. But in the process, they’ll destroy the currency. Make no bones about it, America’s in the midst of going full imbecile. Massive amounts of debt, made possible through a debt based fake money system, have brought today’s many unique possibilities for destruction into existence much sooner than would’ve otherwise been possible. What’s more, the government’s solution, which requires destroying the dollar, is as sensible as cutting off ones head to cure a headache. Of course, faith in the government’s ability to cure all of society’s ailments is what got us into this mess in the first place. For the many unfortunate souls who experience the insidious injustice of having their life savings vaporized through state sponsored currency debasement, such a misplaced faith in government will never return.